As societies grow and become more complex, the need for human behavior regulation becomes critical. The importance of legal profession assumes the center stage; lawyers, judges, and mediators become the movers and shakers of the society. The field of law is a broad, and is constantly evolving due to changing economic, social, and cultural factors. For many, it is difficult to imagine peace and justice in a society where there is no regulation. 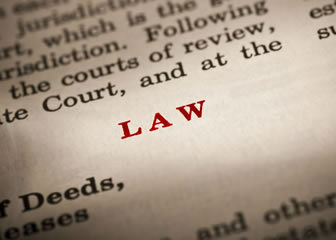 Learn how law regulates and protects our society with a degree in law. The Juris Doctor is a post-graduate law degree. This program is designed to prepare students for practicing law. JD degree holders are also eligible to sit for the bar examination in their state. The duration of the program is usually three years (full-time enrollment). Some of the courses covered in the program have been listed below. Civil Procedure - This course is designed to provide students with a comprehensive understanding of the body of laws and procedures that courts follow when adjudicating civil lawsuits. Constitutional Law - In this course, students are exposed to a body of laws that governs relationships between various entities such as the state, legislature, and judiciary. Contracts - A contract is defined as a legally-enforceable promise between two parties. In this course, students understand the different types of contracts and their nature. Criminal Law - Criminal law covers all legal processes and laws that apply to criminal cases. Students acquire in-depth knowledge of crime and sentencing procedures. This course is usually included in many other law programs as well. Tor - In this area of law, students acquire a comprehensive understanding of the body of laws dealing with civil wrongs that are recognized in the United States. International Law - This course highlights the body of laws designed to regulate international treaties, statutes, national legislation, common law, and more. Students will develop a strong foundation of knowledge and will get a chance to explore the area in-depth. Criminal Law - Students who opt for criminal law acquire an understanding of criminal justice systems, types of crimes, sentencing, and corrections. Healthcare and the Law - In this course, students learn about legal policies and rules that apply to healthcare organizations, healthcare seekers, vendors, and payers in the nation. This is the highest degree available in law. Individuals enrolled in this program have to undertake extensive research and cover a range of advanced topics relevant to their specialization area. The main emphasis is laid on the formulation and completion of a dissertation. Listed below are a few points regarding the program. Students must successfully complete the required courses, each carrying a certain number of credit hours. Students must conceive, develop and defend an argument that is clear, well-reasoned, and well-constructed. Students must formulate a dissertation that is according to the minimum page/word count. This will vary slightly from college to college. The American Bar Association is the leading professional organization that regulates legal work, designs and administers codes of conduct, accredits schools, supports legal professionals, and issues licenses to law-graduates who wish to practice law. The ABA does not accredit JD degree awarding distance-learning law schools, especially those that claim to offer it 100% online. There may however be exceptions in the case of LLM degrees, and so it is important that you check an online law school’s ABA accreditation before enrolling in it. An ABA accredited law school will enable its graduates to take the bar exam in their state and work towards become a licensed attorney. According to the US Bureau of Labor Statistics (BLS), lawyers earned a median annual income of $113,530 in 2012. Their job numbers are expected to increase at a rate of 10% from 2012 to 2022, which is faster than the average job growth in all other fields in this period. Education - Instructor in legal training programs. More specifically, Continuing Legal Education Specialist (CLE). Communications & Entertainment – The negotiation, persuasion and communication skills students learn in their J.D. could be very useful in PR, HR, advertising and marketing firms. Business & Consultation - The services of corporate trainers are in demand. These trainings are conducted to increase productivity, understand ethics and different sociological factors when dealing with international clients. Criminal Justice - Law graduates also work in law enforcement agencies. Also federal agencies such as the FBI and the CIA hire lawyers as in-house counsels. Non Profit – Non federal organizations, think tanks and non profits also have lawyers working for them. These lawyers are mostly activists, researchers and analysts. Can you name the courses taught in online Law and Legal Degrees? What kinds of careers can I pursue with online law degrees? Will I have to quit my job when doing online legal degree programs? Q:What areas are offered for specialization to students enrolled in online 1 yr degree programs in law and legal studies? A:Students can always consider the option of earning degrees through online schools and begin a successful career. Degree programs are available in all fields of study such as business, arts, law, and medicine. Students interested in law can also pursue online 1 year degree programs in law and legal studies, and can specialize in the following areas: human rights, medical law and ethics, environmental law, criminal law, and intellectual property rights law. Q:What are the different practice areas available after completion of Law and Legal Degrees? A:After the completion of Law and Legal Degrees, students can practice law in a number of different professional areas. Following are a few areas: administrative, civil litigation, constitutional, administrative, corporate and commercial, environmental, family, criminal, intellectual property, labor and employment, real estate, immigration, tax, securities, health, municipal services, and many more. Q:Can you name the courses taught in online Law and Legal Degrees? A:Online Law and Legal Degrees emphasize on a comprehensive set of courses including the history of American legal system, philosophy of law, legal actions, conflicts resolution, research methods, and law functions in society, The courses offered in these degrees vary with the area of specialization chosen. Q:What kinds of careers can I pursue with online law degrees? A:A degree in law can open up the doors to various law careers. The job position and salary will depend upon your specialization and level of degree earned. Some of the main careers that can be opted for in law include the following: lawyers, advocates, judge, para-legal, attorney, law journalism, and civil service. Q:Online law degree programs can be completed in which specialization areas? A:Law is a very vast field covering all kinds of areas. The career opportunities are lucrative and broad. One can specialize in all kinds of law areas. Some of the main law specialization areas have been mentioned here: criminal law, real estate law, family law, accident law, corporate law, environmental law, agriculture law, employee benefits law, and more. Q:Is an online law degree recognized by employers in the industry? A:Online law degrees are recognized by employers in the industry as long as the program is accredited. Online education has gained much popularity over the years and is accepted by many industries. It is important to make sure you earn a degree from a school that is accredited by the relevant agency. Take a look at our page for more detail. Q:Will I have to quit my job when doing online legal degree programs? A:The purpose of an online legal degree program is that students are able to pursue full time work while studying for their chosen degree. You can take the program online which will allow you more comfort and flexibility regarding the timings and the course content. This way you'll be able to set a pace that will not disturb your job. Q:What is covered in a Law Degree Online, can you tell me briefly? A:A law degree will basically provide students with in-depth knowledge of the judicial system and legal industry. Students will learn about various aspects of law and how trials are conducted. The coursework will however vary slightly from school to school and will depend upon the type of degree being pursued. Q:Can you give me some information about online law degree accredited program? A:If you are interested in earning a law degree, there are a number of accredited schools that offer online law degrees. Whether you are seeking to earn a Juris Doctorate (JD) or a Masters of Law (LLM), there are online options that may suit you. The coursework is typically covered online via lectures and videos. It is important that you check an online law school's ABA accreditation before enrolling. Q:What can you do with a law degree? Q:Can I go back to school to earn a paralegal degree? A:Yes, you can go back to college to earn a degree in paralegal studies. Many colleges are offering degree completion programs, short course, diplomas, and certificate programs designed for working individuals. You can also opt for online paralegal degrees. This mode of learning can be tailored to suit our lifestyle and work schedule. Q:I am disabled and wish to pursue a degree in law. Can I become a lawyer despite my disability? A:Did you know that there are over 2.4 million students with a disability are currently enrolled in a college according to the U.S Department of Education's National Center for Education Statistics? Online learning has made education more accessible for individuals with disabilities. However, the effectiveness of online learning also depends on the kind of disability you have. In an online degree program, you can study from the comfort of your home without having to worry about travelling. Q:What law degree program should I pursue after a master in business and education? A:With a master in business and education, you are well equipped to pursue a degree in several branches of law. One of the most obvious choices could be a public policy law degree. Another degree you could go for could be a business law degree. There are many law schools in the United States who would be willing to accept graduates with non-law backgrounds. Q:Currently, I have a masters degree in business leadership and i want to pursue a PhD in human right law. I would prefer a program that is online. What university can I apply to? A:There are very few universities in the United States that offer accredited programs in human rights law online. A PhD program would require you to research extensively and take around 3-8 years of your time. Common graduation requirements include a doctoral dissertation. And to be eligible for admission into a PhD program, you will require a bachelor's or master's degree.